It is no secret that the Steelers have been the most successful franchise in the history of the NFL. The numbers can do the talking, as the Steelers have six Super Bowl victories, more than any other team. Everyone knows about the team’s recent successes under Mike Tomlin, as the Steelers are one of the perennial favorites to win the Super Bowl. There are some things, however, that the average Steeler fan may not know from years past. 1. While the Steelers do lay claim to more Super Bowl victories than any other franchise, they were not always a very successful team. Sure, every team hits some rough patches now and then, but the Steelers had a rough patch lasting almost forty years! The Steelers were founded in 1933, but it wasn’t until thirty-nine long years later that they finally won their first playoff game. Franco Harris’ Immaculate Reception in 1972 versus the Oakland Raiders has long been known as one of, if not the best play in NFL history. What might surprise many of today’s fans is that that play propelled the Steelers to their first playoff victory. Granted it was only their third try, but thirty-nine years is a long time to wait before advancing to the second round of the playoffs. 2. The Steelers are one of only six NFL teams that do not field a cheerleading squad. 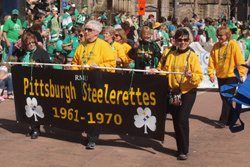 In 1961 the team debuted their first cheerleaders, the Steelerettes, who lasted nine seasons before team President Art Rooney decided to cut them from the program. According to Rooney, he felt that the cheerleaders were a distraction. He felt that people came to the games to watch what goes on during play, not to be thrown off by what happens on the sidelines. Super Bowl XLV, played in 2011 between the Steelers and the Green Bay Packers was surprisingly the first Super Bowl to feature two teams without cheerleaders. 3. One very fun fact about the Steelers features their various uniform styles. In 2007, the Steelers introduced a new throwback uniform. It is worn twice each season, both times at home. One of those times is reserved for when their arch-rival Baltimore Ravens come to town each year. In the 2008-09 season, not only did the Steelers become the first franchise to reach six Super Bowl victories, but they also achieved another NFL first. They became the first NFL team to beat the same team, the Ravens in this case, wearing three different uniforms in the same season. The throwbacks were worn in Week 4 when the Ravens came to Pittsburgh, the white road uniforms were worn later in the year in Baltimore, and the regulation black home uniforms were worn against Baltimore during the AFC Championship game played at Heinz Field. 4. The Steelers have very unique helmets compared to the other 31 teams in the NFL. 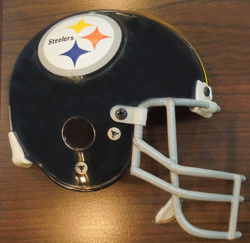 The Steelers’ helmets are the only franchise in the league to feature the team’s logo on only one side of the helmet. Their current logo was originally used as an advertisement for the American Iron and Steel Institute in 1962. It was tested on only one side of the team’s gold helmets, per Rooney’s instructions. When it was decided that the helmet color would permanently be black, they also decided that having the logo on only the right side would be permanent as well. 5. 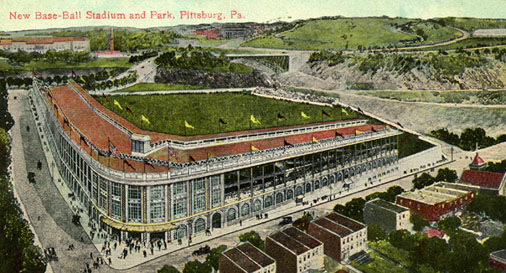 When speaking about Pittsburgh, one automatically associates the name “Pirates” with the city’s baseball team, but the Pirates were a favorite name for two other franchises. The NHL franchise in Pittsburgh from 1925-30 was also known as the Pirates. When Art Rooney founded the football team in 1933, their first few games were played at the Pittsburgh Pirates’ Forbes Field, home of the city’s baseball team. As was the custom in that era, Rooney named his team after his current landlords. Rooney’s timing with founding the football team was absolutely perfect. It was confusing enough having two teams with the same name, but three would have been disastrous had hockey team still been around at that time. The football team would remain the “Pirates” until 1940. 6. What do the Steelers and the Supreme Court have in common? The answer is former Supreme Court Chief Justice Byron White. White was one of two Chief Justices to be appointed by President John F. Kennedy. He played college football for the Colorado Buffaloes where he enjoyed a very successful career, even being voted an All-American. When he graduated, White was signed by the Steelers, making him the highest paid player in professional football at the time. He stayed with the team for one season. The Steelers also have strong ties with another big name outside of the sports world. Fast forwarding about 45 years into the future, Married…with Children was one of the most popular shows on television in the late 80s. The lead character of the show, Al Bundy (played by Ed O’Neill), was always reminiscing about his high school days in which he was a star football player. An interesting fact about O’Neill is that his character was actually based on reality. Ed played football at Youngstown State University in the 60s and O’Neill was, believe it or not, signed by the Steelers in 1969. Sadly, though, Ed never made the final Steeler roster as he was cut during training camp. 7. 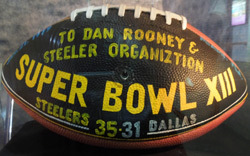 As previously stated, the moniker Steelers is not the only name that the football franchise has been known by. At the time of their founding, they were named the Pirates. During World War II, many players were drafted by the U.S. Military and thus had to quit the Steelers in order to defend our country. During this period with the shortage of players in the early 40s, Art Rooney sold the team to Alexis Thompson and Rooney went to work with his friend, Bert Bell, the owner of the Eagles. Thompson then merged the players of his team with those of the Philadelphia Eagles and held a small player draft. Thompson’s new Pittsburgh-based team was called the Iron Men, while Bell’s team kept their original name of Eagles. Rooney, however, didn’t like being away from Pittsburgh, so the two teams swapped cities. The Eagles, along with Bert Bell, moved to Pittsburgh and became the Steelers, while Thompson and the Iron Men moved to Philadelphia and they became the Eagles. A couple of years later, due to more men being lost to the military during World War II, the two teams were forced to merge, thus becoming known as the Steagles. Only one year later in 1944, the Steagles went their separate ways. Once again, and for the same reasons as before, the Steelers were forced to join forces with another team. This time the team was the Chicago Cardinals. The new winless team was known as Card-Pitt. By the following season, the two teams had gone their separate ways, and the Steelers reverted to being called the Steelers, all by themselves! 8. The 1979 Steelers were the first team to be entirely home grown. Every player on the Steelers’ roster was either drafted by the Steelers or was signed as an undrafted free agent. That means that not a single player on the Steelers’ roster that year had worn another NFL uniform in their career leading up to 1979. 9. Joe Gilliam was drafted by the Steelers in the 11th round of the 1972 draft. He was not the first African-American quarterback to ever grace the NFL. He was beaten to that title nineteen years earlier by Willie Thrower. What makes Gilliam so special is that he was the first African-American quarterback to ever start in the NFL. He started one game in the 1973 season for the Steelers and made six more starts the following season before being replaced by Hall of Famer Terry Bradshaw during the team’s first Super Bowl run. 10. As of late, the Steelers have been known for their unprecedented success in selecting head coaches. The team, however, struggled to find a steady coach in its earlier days. From 1933 to 1968, the Steelers shuffled through thirteen different head coaches, struggling to find one to help the team excel. That one man was finally found in 1969: Chuck Noll. His tenure lasted through the 1991 season. From 1969 to today, the Steelers only had three different coaches: Noll, Bill Cowher, and Mike Tomlin. It is quite a change to go from thirteen coaches in thirty-five years to merely three coaches in the past forty-three years. Another measure of the Steelers’ recent coaching success comes from current bench boss, Mike Tomlin. Tomlin was hired by the Rooney family after the ’06 season, and two years later at the age of thirty-six, he became the youngest head coach to lead his team to a Super Bowl victory.